Indo Chinese Food is very popular in India. It is basically a fusion cuisine. 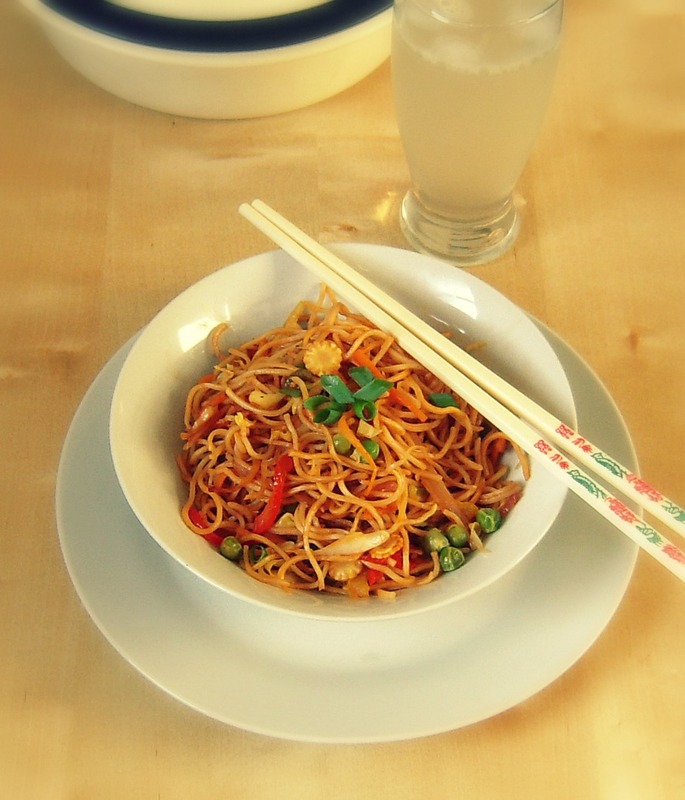 Veg Chow mein is perhaps one of the most popular Indo Chinese dishes. From road side carts to posh restaurants, this humble noodles finds a place in many menus. 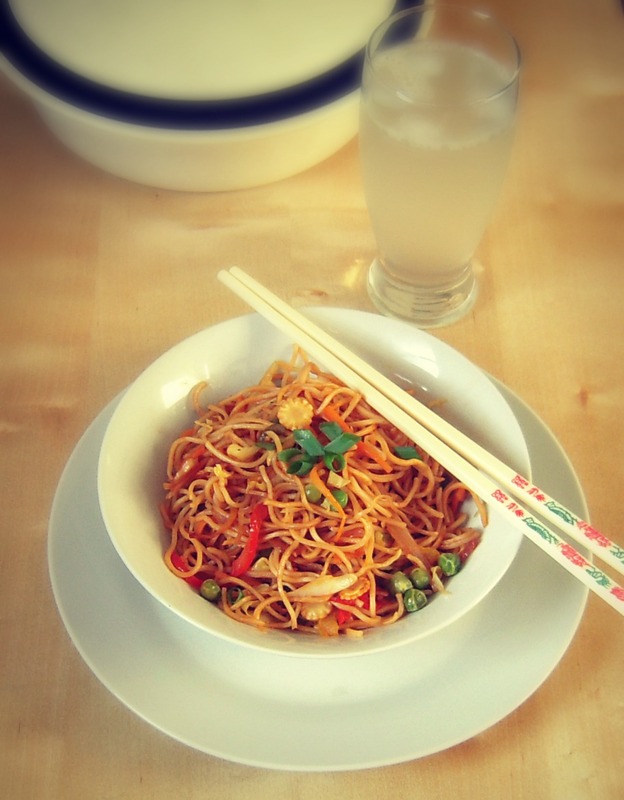 2 tbsp chilli sauce( add more if you like it spicier). 1. Cook the noodles as per the instructions given on the box. Make sure you cook it upto 80%. When it is sautéed with veggies, it will cook further. 2. Heat oil in a pan. When heated add the sliced onions. Fry them till they are slightly translucent. Add the ginger and garlic and sauté it for 30 seconds. Now add the carrots, beans and baby corn. Add salt and stir. Cover it and cook for 2-3 minutes, so that the carrots, beans and baby corn are tender. Now add the cabbage, bell peppers and peas. Stir and add some more salt and pepper. 3. Now add the cooked noodles and give it a nice stir. Add the soya sauce, chilli sauce, vinegar. Give it a good stir. Check seasoning. Add more salt and pepper if needed. Cook for another 3-4 minutes and take it off gas. 4. 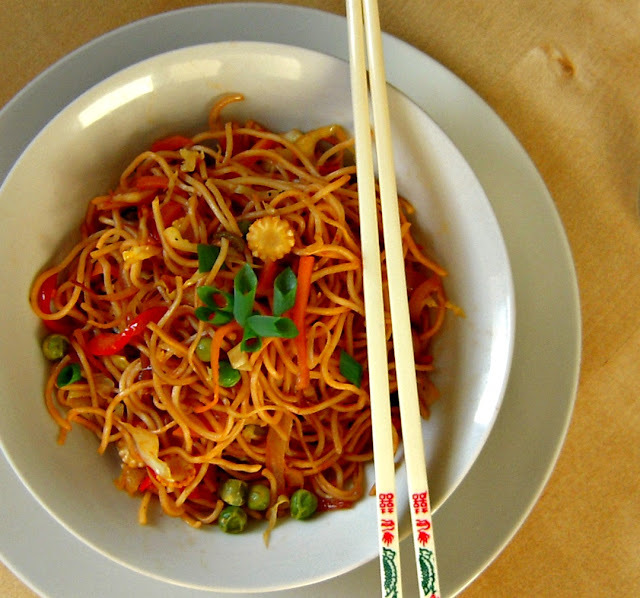 Serve it hot with Sweet chili sauce or ketchup or both! Enjoy! We had it with Chilled Sweet Lime Soda.. Note: You can also add tofu or paneer pieces.